Retail Warehouse Sale 2019 - PRE-SHOP - Feb 15, 2019 - Oak Park-River Forest Chamber of Commerce, IL ? 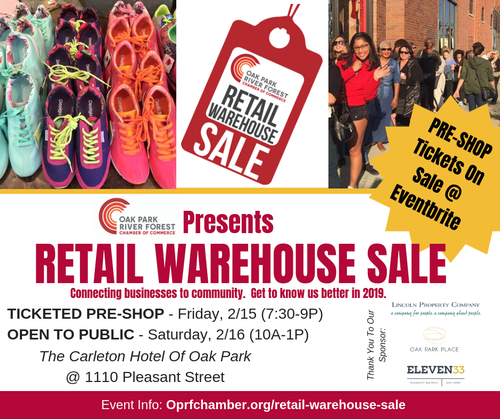 The 2nd Annual Retail Warehouse Sale Pre-Shop, taking place Friday 2/15, from 7:30-9P, at the Carleton Hotel in Oak Park, will feature exclusive access to first picks from top area retailers selling end-of-season stock in this exciting annual event. Deals abound, retailers rejoice and the public goes nuts. Want a night out to pre-shop this great event? Buy your ticket here today -- quantities are extremely limited and the pre-sale WILL sell out. Didn't attend the event in 2018? Chek-out our video to view the shopping excitement. Or visit our Retail Warehouse Sale homepage to learn more, including listing of 2018 vendors. Interested in coming back to shop again on Saturday? Many retailers planning to replenish sale stock prior to Saturday, 2/16, open-to-the public hours (10A-1P). Admission is FREE. Register in advance here to skip the line. Ticketed attendees, the Carleton invites you to park for FREE in any of their owned parking lots surrounding the hotel. View here for parking lot map. Or park on street, standard fees apply.